Last week I was on vacation in Maine, USA. it seems August is known as Fogust on the Maine coast. So, now I have many photos of fog to sort through. Your photo looks just like a postcard!! What a beautiful part of our country. Beautiful colors BEcky. Can't wait to see what you post for us to see. So you blew the only blue sky pic on us at the outset? Knowing you, I'm sure even your gray sky pictures are spectacular! 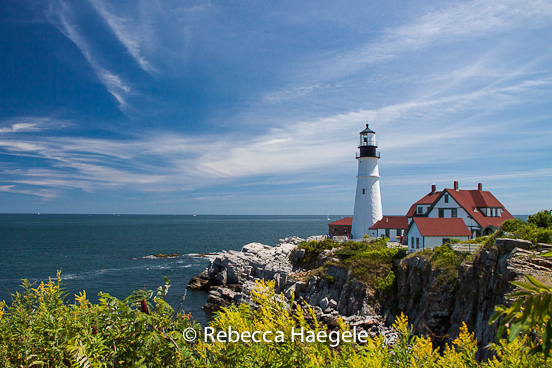 Your lighthouse picture is beautiful, Rebecca. If I didn't know you always take wonderful pictures I would say that you DID scan a postcard. We've been to that lighthouse. Isn't it wonderful. Why don't you come to Texas to see ours? And drop in on Mrs. Jim and me too. We have one here at the Bolivar Peninsula and another over at Port Isabel. The second on you can go in as it is touristy. The first is now private and you just have to drive by.